Death to the Stock Photo, used under license. This year had more than its share of highlights and lowlights in the world of media metrics and impact. For all the advances that have been made to prioritize impact or subscriptions, verify ad data or use metrics to improve editorial judgment, there seem to be an equal number of missteps. For months, we’ve seen reports of errors in Facebook metrics, predictive analytics have transformed newsrooms into trend-chasing bots, and there is the stubborn persistence of page views as a quotable number inside and outside organizations. We’re heading in the right direction. There is evidence of it all over MetricShift, including innovative approaches to teaching metrics at journalism schools, a growing body of research on the impact of journalism, and real-life case studies on using meaningful metrics in the newsroom. 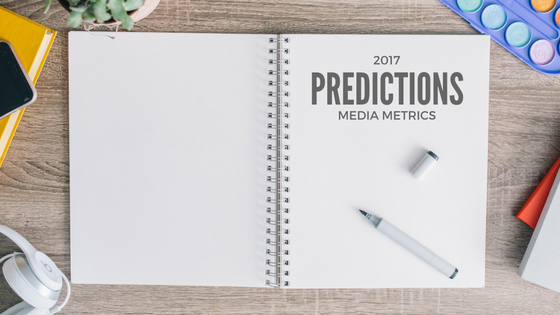 Here are my predictions for what will happen in the big, wide world of media measurement and impact in 2017. The campaign was a virtual boon to digital news media that we all expected to disappear on Nov. 9, regardless of who won the election. Now it seems more likely than not that the ride will continue. The president-elect has shown no signs of muting his Twitter account or shying away from the soundbites that launched a million Facebook clicks. I don’t see a cliff coming yet, but we’ve reached a plateau where publishers aren’t going to be able to accumulate a massive audience through referral traffic and continue to grow it at the rates we’ve seen the past few years. That era has passed, with top-to-bottom implications for how newsrooms are staffed, what resources are put into distribution, and the financial model for even behemoths like BuzzFeed. You see this new reality reflected especially clearly in the two highest-profile digital media projects out there right now, both from successful industry veterans hellbent on reinventing everything agin: Joshua Topolsky’s infinite-swipe The Outline and Jim VandeHei’s ultra-premium Axios. Neither is betting that their audience will arrive for quick bites a dozen times a day from social media. And as referral traffic plateaus, publishers will stop talking about total uniques. Business people don’t talk about numbers that are no longer growing. Publicly held and VC-backed companies alike are going to feel the pressure of the precedent set in recent years, and it will be interesting to see how they react. Do nonprofit sector trends follow the same hype cycle as emerging technology? If so, media impact measurement in 2017 will finally reach the plateau of productivity after a roller-coaster of inflated expectations and a very low trough of disappointment for many journalism funders in 2016. Subscribers have flocked to the New York Times, the Washington Post, the Atlantic, Mother Jones and other publications since the election, news that those outlets haven’t proudly shared. Nonprofit newsrooms like ProPublica are also seeing an uptick in donations and new members. You get the news you pay for, and people who want better news — and want to incentivize better news — are opening their pocketbooks. 2016 saw the widespread adoption of Google’s Accelerated Mobile Pages project and its competitors like Facebook Instant Articles. Publishers face a difficult choice, risking ad revenue, control over story layout, and lock-in to systems they don’t entirely control (or in some cases don’t control at all). The Washington Post has gone all-in, while The New York Times is being more cautious, and that split is industry-wide. Can an algorithm tell you whether a piece of news is any good? Mark Zuckerberg says this is a big challenge, but Facebook also fired all its human editors. A handful of high school students at a hackathon built a Chrome plugin that isn’t half-bad. Google has been tweaking PageRank since I started working in digital media reading SEO blogs. At Stanford, Frederic Filloux is working on this question for this JSK fellowship.